The Georgia Aviation Hall of Fame calls Hazel Raines the “First Lady of Flight.” This is an accurate description on many counts: Raines was the first woman in Georgia to earn a pilot’s license, in the late 1930s. She was among the first group of women during World War II to be chosen by the British Air Transport Auxiliary (ATA) as ferry pilots for the Royal Air Force in 1942. She was one of the first WASPs (Women Airforce Service Pilots). And during the Korean War, she was the first female reserve pilot called into active duty. These distinctions — indications that Raines paved the way for generations of female pilots who followed — are important, but they are not the sum of Hazel Raines. Like many other women, her work supported the efforts of others. Raines was born in Waynesboro, Georgia, in 1916 and grew up in Macon. After graduating from Wesleyan College in 1936, Raines took her first flight lessons on a dare. She earned her private pilot’s license (and, eventually, a commercial pilot’s license from Eastern Air Lines) and embarked on a career as a stunt pilot, barnstorming with the Georgia Air Races and Show. During these early years, Raines was essentially an entertainer in an airplane, thrilling audiences across the South. Meanwhile, in Europe, the political situation became ever-more serious. It was here in Georgia, though, performing stunts and acts of derring-do, that Raines would hone an impressive set of skills that would serve her — and, indeed, freedom-loving people the world over — well in the years to come. Raines’s next career move was to join the Civilian Pilot Training Program. Established by the government in 1939, the program was America’s answer to similar undertakings in Europe (namely in Germany and Italy). The program’s goal, as its name implied, was to train more civilian pilots. As events in Europe took their course with the Nazi invasion of Poland that same year, the program’s military potential became ever-clearer. Raines became an instructor with the program, and trained pilots for the Army and Navy Air Corps at Cochran Field in Macon and at a Fort Lauderdale aviation school through March 1942. 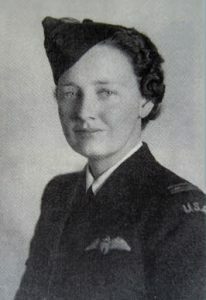 That spring Raines and 24 other hand-picked female pilots left North America’s shores via ship convoy to join the British ATA, which was responsible for transporting military aircraft. Working behind the scenes, however, didn’t mean that Raines was safe from danger. She and the other ferry pilots frequently flew damaged planes with which they’d had no experience other than a quick read through the manual before taking off. To avoid Germans, the pilots flew without radio contact, which was essential as ATA pilots had no ammunition or defenses on board. Raines survived World War II and the Korean War, in which she also participated. When she died of a heart attack in 1956 at age 40, Raines departed this earth with 6,400 flight hours and 20 years of experience as a pilot. In addition to flying with the ATA, she had served her country as a WASP, as part of the Third Air Force during the Korean War, as a recruiter for the Women’s Army Corps and the Women in the Air Force (WAF) program, and finally, as a WAF advisor. In 1989, Georgia recognized the accomplishments of the former barnstormer from Macon with her induction into the Georgia Aviation Hall of Fame. She was inducted into the Georgia Women of Achievement Hall of Fame in 1995. Allison Hutton is program coordinator at Georgia Humanities.